Cliff Dwellers is located less than a quarter mile from Potawatomi State Park. This park features 2 miles of rugged Sturgeon Bay shoreline, an observation tower, hiking, biking and more. Door County Maritime Museum features city’s shipbuilding history. Located on Sturgeon Bay’s west side waterfront. Tour the waterfront aboard the former City of Chicago fireboat! Each 2 hour tour includes the Sherwood point lighthouse and the Sturgeon Bay Canal Station. Idlewild Golf Course was recently rates 4 stars by Golf Digest. Beautifully maintained championship course with exceptional greens and natural scenery. 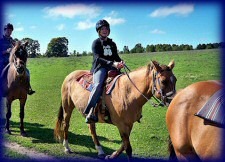 Offering summer season horseback trail rides are based on a first-come first-serve basis. Door County Trolley, Inc. offers a Lighthouse tour, a Scenic tour, and a Ghost tour. Door County Kayak Tours and Rentals. Carlville Door County Coffee & Tea Co. Fantastic gourmet coffee roasted by a local family owned business. Made the old-fashioned way with Specialty Class 1 Arabica coffee beans in small batches. A Guided Segway Tour! Unique, fun, & easy. Choose your adventure: Peninsula Park, Baileys Harbor Lighthouses, Ellison Bluff, Washington Island, Everything Sturgeon Bay, Sunset, Eco-Tours, & more. Call for a reservation. Beautiful garden theater established in 1935. The Ice Age Trail runs through Cliff Dwellers Resort. The Ice Age National Scenic Trail is a thousand-mile footpath — entirely within Wisconsin — that highlights these Ice Age landscape features while providing access to some of the state's most beautiful natural areas. In the opinion of the Cliff Dwellers management, Capt'n Snap is the best charter fishing guide in the county. Chosen "Best of Show" at the 2006 Door County Maritime Museum's "Classic and Wooden Boat Show." Daily charters depart from the dock of Robertson's Cottages at Idlewild. Also known as Door County Boat Rental. Largest and most affordable boat rental service in Door County just 5 minutes walking distance from Cliff Dwellers Resort. Cliff Dwellers Resort offers older one speed bicycles free with your stay. Nor Door Sports bicycles are newer and multi-speed for the more serious rider. Rents bicycles from a concession stand in Potawatomi State Park. A living museum of Rural America. Kind of a cross between a petting zoo, working farm, and museum. Very popular with kids. Includes the historic Village at Crossroads, 7 miles of nature trails, and various scientific activities. Door County Zip Line Tours of the Rowleys Bay Natural Area Preserve. Also has climbing wall and kayak tours. With an absolutely no pets at Cliff Dwellers Resort, Idle Wild Kennel is an excellent place to board your cat or dog nearby. Cash or Check. For more activities in Sturgeon Bay. For more activities in Door County. Download themed .pdf brochures and maps from doorcounty.com. This is probably the most useful link on this page.